Here is a video recap from Reuters expaining what happened on Tuesday with "the glitch" that sent the Dow tumbling in minutes. The first thing that you want to look for is a trend line break on a correctly drawn trend line. The trend has not changed yet. This criteria gives you a heads up on a possible change in trend. After the trend line has been broken, the stock will rally but fail to move above the prior high. The trend has not changed yet. We still need one more criteria to confirm the change in trend. Finally, the stock moves below the prior swing point low and the change in trend is confirmed. This example is for a stock that is moving into a down trend. The rules are just reversed for a stock that is moving into an uptrend. If two out of the three conditions are met, the chances are good that a change in trend will occur. If all three conditions are met, the trend change has occurred and is most likely to continue in its new direction. These rules won't work 100% of the time, but I think you will be impressed by how often it does work. Pull up any chart and test out the rules. See if you could have anticipated a change in trend. Also, try it out on weekly charts and intra day charts. Now I just need to figure out how to identify a change in trend with my wife's mood swings. THAT would be impressive! Swing trading is great but it's nice to get in a few trend trades every now and then. When you run your scans and find stocks entering a stage two or a stage four, consider holding it for a longer period of time. This is a real easy and un-emotional way of trailing your stops for trend trading. The basic premise is this: Every time the stock closes at a new high, move your stop underneath the prior swing point low. We start at the left side of the chart (#1). This stock pulls back into the TAZ and forms a nice hammer pattern. We notice that it is at the beginning of the trend, so we decide to ride out the trend. Our stop loss order goes under the low of the hammer. The stock rallies and then pulls back to #2. This is where we will put our stop loss order, but it first has to close at a new high. The stock rallies for awhile, then there is a significant pullback to #4. We can't move our stop up yet. We need the stock to close at a new high. There is a nice move and a close to a new high at #5 so we move our stop under the swing point low at #4. And so on. Every time the stock rallies and closes at a new high, you move your stop up to the most recent swing point low - until stopped out. Of course, this is reversed for short positions. 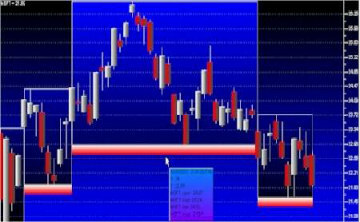 In this case, every time the stock closes at a new low, you would move your stop down above the prior swing point high. Is there a disadvantage to trailing your stops this way? Yes. Sometimes you can give up a significant portion of your gains before getting stopped out. But, the advantage is that your stop loss order is safely away from the market "noise" to ride out the trend. If you have ever read the book, How I Made 2,000,000 in the Stock Market by Nicolas Darvas , then you already know about Darvas Boxes. This was a simple breakout system that he used to make a fortune in the stock market. I started to realize that stock movements were not completely haphazard. Stocks did not fly like balloons in any direction. As if directed by a magnet, they had a defined upward or downward trend which, once established, tended to continue. Within this trend stocks moved in a series of frames, or what I began to call "boxes". When you get to the home page, scroll down to the middle of the page and you can enter any ticker symbol to see the chart with the Darvas Boxes drawn in. They also have free stock screeners and scans for candlestick patterns. Pristine.com will offer free access to it's Pristine Method Trading Room, Pristine Swing Trader, and Pristine Core Trader services. If you are not already a subscriber, you will have to sign up from the home page. Then, when you log in, you will see the links to the free services. You will learn more about how to interpret price action in one week, then you have probably learned in your entire trading career!